Presentation of CHIPS 2020 at the 2012 International Solid-State Circuits Conference (ISSCC), San Francisco, CA. From left to right: Barry Pangrle, Albrecht Rothermel, Boris Murmann, Yiannos Manoli, Matthias Keller, Bernd Hoefflinger, Burn Lin. On July 30, 1959, Robert Noyce filed his Integrated Circuit patent. Its fiftieth anniversary in 2009 became the origin of this book and its central question: After the unparalleled progress of microchips over half a century, can this story continue, and what will it take to make this happen? The central issue of this book emerged owing to more and more signs of the imminent end of the nano(meter) roadmap: The law that halving the transistor size every 18 months would bring automatic performance and market growth is about to end in 2015. When the billions of 10 nm x 10 nm transistors packed side-by-side on a chip are hardly useful because of their fundamental statistical variance, we face the most important turning point in the history of microelectronics: Declining growth in markets and services and an energy crisis on top, because, with the chip technology of 2010 and with the present annual doubling of video and TV on the internet, this service alone would require the total worldwide electrical power in 2015. 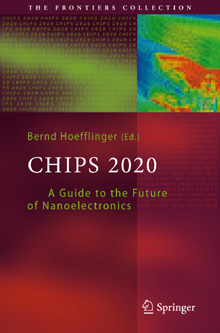 Chips 2020 explains the background to the 20–10 nm transistor limits in different applications, and it focuses on the new strategy for the sustainable growth of a nanoelectronics ecosystem with a focus on ultra-low energy of all chip functionalities, femtojoule electronics, enabled by 3D integration on-chip and of chip-systems incorporating new architectures as well as new lithography and silicon technologies. At the critical time of this new fundamental energy orientation, I have been very fortunate that several world leaders with their teams agreed to contribute to this book: Greg Delagi of Texas Instruments, on intelligent mobile companions, the new lead products; Georg Kimmich of ST-Ericsson, on 3D integration for wireless applications; Burn Lin of TSMC, on nanolithography; Jiri Marek and Udo Gomez of Robert Bosch GmbH, on MEMS (micro-electro-mechanical systems) for auto- motive and consumer applications; Barry Pangrle of Mentor Graphics, on power- efficient design; Peter Roth and colleagues at IBM, on superprocessors; Yiannos Manoli with his team at the University of Freiburg, together with Boris Murmann of Stanford University, on analog–digital interfaces and energy harvesting; Albrecht Rothermel of the University of Ulm, on retinal implants for blind patients; and Ben Spaanenburg with his co-author at Lund University, on digital neural networks. This book would be unthinkable without their contributions, and, in this critical situation for nanoelectronics, I am even more obliged to them for their involvement in this project. Despite our broad agenda, we could cover only selected topics, which, we hope, are exemplary for the potential and challenges for 2020 chips. My sincere thanks go to Claus Ascheron at Springer in Heidelberg, who constantly pursued the idea for this book and who finally convinced me in 2009 to realize it. I thank the team at Springer Science+Business Media for their confidence in this publication. With experience as the first MOS product manager at Siemens and of co-founding a Technical University and establishing several microchip research facilities in the USA and Germany, I have included educational, research, and business aspects of the nanoelectronics ecosystem. I hope that, with this scope, this book will be helpful to all those who have to make decisions associated with future electronics, from students to graduates, educators, and researchers, as well as managers, investors, and policy makers.